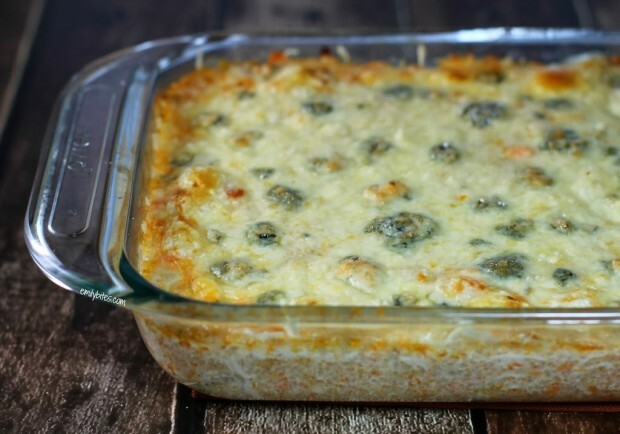 Cheesy, spicy, creamy, hearty, warm, comforting, and only around 300 calories for this Buffalo Chicken Quinoa Bake? Pinch me. Being a home-grown Buffalo girl, anything with Buffalo chicken flavor is an automatic win in my book. Lately I’ve been daydreaming of a Buffalo Chicken casserole and after considering a pasta bake, I decided to make it a little healthier and use quinoa. For those of you who are only familiar with quinoa from the recent Bud Light commercial (pro-tip: it’s actually pronounced like keen-wah), quinoa is a grain that is high in protein and fiber and is naturally gluten-free. Once cooked it takes on sort of a bubbly appearance which I personally think makes it fun to eat. Quinoa is cooked in a similar manner to rice and can be used in many of the same types of dishes where you might usually use pasta or rice. This dish was exactly what I had been craving. I used a half cup of wing sauce so mine was plenty spicy, the celery and carrots added little bits of crunch and the protein packed chicken and quinoa made for a very satisfying serving. Plus, it was creamy, cheesy and warm and made perfect comfort food on a cold day. I know y’all are going to ask if you can use ranch dressing instead of blue cheese dressing. For those of you who have been with me for a while, you know the Buffalo girl in me screams “NOOOOOOOOOOOOOOOOO!!! !” but the food blogger in me says “alright, if you must.” 😉 Don’t forget to check out my Easy Slow Cooker Shredded Chicken post- the perfect way to make shredded chicken for this recipe! Can’t get enough Buffalo chicken goodness? Try Buffalo Chicken Enchiladas, Buffalo Wing Hummus, Buffalo Chicken Mac & Cheese Muffins, Buffalo Chicken Pizza, Buffalo Chicken Chili, Buffalo Chicken Wonton Cupcakes, Buffalo Chicken Roulades, Slow Cooker Buffalo Chicken, Buffalo Cheese Bread, Buffalo Chicken Meatballs, Buffalo Chicken Bites, and Buffalo Chicken Wraps. In a large mixing bowl, combine the yogurt, blue cheese dressing, cream cheese and wing sauce and stir to mix. 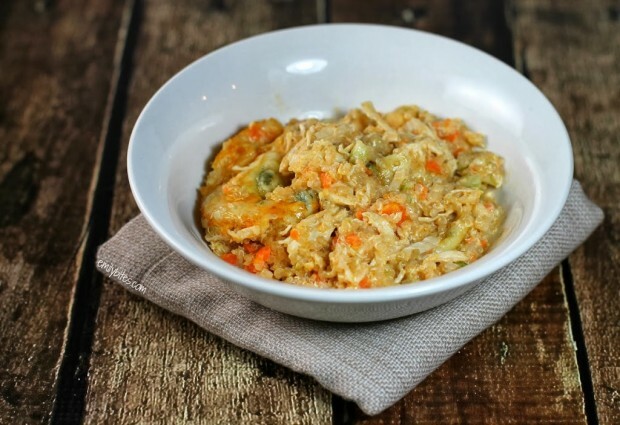 Add the shredded chicken, carrots and celery and stir to combine. Add the quinoa and stir until well combined. Transfer the quinoa mixture into a 2 quart casserole dish (I used a 7×11, but you can use an 8×8 or 9×9) and spread evenly. Sprinkle the cheddar across the top and follow with the crumbled blue cheese. Bake in the oven for about 20 minutes until heated through. Turn the oven to broil and move dish to a higher oven rack. Broil for 1-2 minutes until cheese is golden and bubbly. This looks amazing! I just scratched tomorrows dinner plans in lieu of this! Can’t wait to try. Thanks for all your amazing recipes. 1/2 cup wing sauce plus bleu cheese dressing ?? Sunds good, but I’d be bloated for a month with all that sodium..any way of making the spicy sauce low sodium without using buffalo sauce? You need hot sauce or else it’s not Buffalo chicken! Sorry to hear this isn’t the recipe for you. Feel free to use less wing sauce if you like…1/2 cup makes it pretty spicy, that’s why the recipe has a range. This looks amazing!!! I’m definitely making it soon. Emily, if I use pasta instead of quinoa, how much should I use to keep the points the same? I’m just not sure about the quinoa. Thanks! This looks great! The family is not crazy about blue cheese….Could you substitute ranch dressing? Great recipe, Emily! Are your servings sizes 1 cup? When I make casseroles I just cut it into 6 servings, grid style. This looks SO yummy and it is in my dinner lineup for the week! Sounds good! I’m not crazy about quinoa. I saw someone asked about pasta. Do you think that or brown rice would be a better substitution? As another Buffalo girl, I’m not sure what actual “wing sauce” is – so it’s not straight Frank’s? Or would it work? Frank’s makes a wing sauce. So does Wegman’s, Anchor Bar…. Check out the hot sauce/bbq sauce/marinade section. Wegman’s wing sauce is the best. Made it tonight and it was phenomenal!!! Thanks!! Thanks for your delicius recipe! i made this last night and it was DELICIOUS! Thinking of subbing the celery for small diced broccoli as that’s what I have on hand. Going to try this on the weekend! Made this for dinner tonight! Was a big hit. Used a little over 1/3 cup wing sauce, but next time will use the 1/2 like you did! Used red quinoa, as that is what we had on hand. The red gave it a yummy earthy flavor. Thank you for another keeper recipe. I made this for dinner yesterday. Both my hubby and I LOVED it!! He is generally on the picky side–but said this recipe is a keeper!! Thanks for the great new addition to “the lineup”!! When I put this in my recipe builder, I get 12 points per 6 servings…? unsure what’s up with that, however, this is totally worth it, delicious! Hm, could you be tracking the quinoa as uncooked? I ran the recipe through both the ww rexipe builder and the nutrition calculator on myfitnesspal and got the same points both times so I’m not sure how you’d get 12. Glad you liked it! I ran it throw the builder and got 6 points for a 6th of the casserole. I made this recipe tonight and it was perfect! My family and I loved it. We went with a 1/2 cup wing sauce and I think the spice level was pretty good (I like it spicy)! And, I added onion for some extra flavor, but it was hardly noticeable with everything else going on. Thank you for sharing! So glad it was a hit! I made this tonight. The only thing I would change is to sautee the carrots and celery first. They didn’t cook at all in the 20 minutes it was in the oven. I’d prefer them soft, not crunchy. I used extra hot sauce (I only had the hot sauce, I didnt have the wing sauce). It was delicious!! I liked the bit of crunch, but I totally understand some people might not. So happy you enjoyed it anyway! Made this for Oscar night last night and looooved it (only change was upping the carrots to 1 cup because we had a ton and adding 1/2 an onion). I’m betting it would be easy to tweak this into an enchilada casserole! I made this for dinner last night and I have to tell you it was delicious! My husband thinks I am obsessed with Buffalo Chicken everything (he might be right) and always makes a face when I serve it (maybe because the results are often so-so!). And he complains endlessly about how weird quinoa is and “can’t we just have pasta”! haha! But I divided this into 6 portions and he ate FOUR of them!! I had to wrestle the last serving away so I could have it for lunch today! Thank you!! That’s an awesome reaction!! I’m so happy to hear he loved it. Thanks for sharing that! This was very good. I agree that celery and carrots need to be sauted before adding as they remain a little crunchy. Used 1/2 cup of sauce but didn’t think it was too spicy (but I like heat). Glad you liked it! I enjoyed the crunch but definitely suggest sauteeing them first if you don’t like it. I took the idea of this recipe (because we had your buffalo chicken pizza the night before) and made it into more of a chicken pie recipe. I subtracted the blue cheese and wing sauce for 1/2 can of cream of chicken and follow the rest of the recipe, it came out really delicious! Definitely going to do the original recipe soon. Yay for getting creative! Glad it turned out great! This was fantastic!!! My hubby hates quinoa with a passion and absolutely devoured two servings of this. I did not feel like I was eating a diet friendly recipe at all- it was that good!! Definitely keeping this as my go to when I am craving chicken wings! Thank you. I wasn’t sure I was going to like the carrots and celery not cooked first but I LOVED the crunch! This recipe was so easy to follow and it was a big hit!! I’ll definitely be keeping this on our menu! All I can say is…YUM!! Made this tonight and quite honestly, I could eat the whole casserole without making any excuses, it’s that good! My 91 year old mother had seconds (I only had one portion since I am the one on WW), but I am already looking forward to lunch tomorrow! The only change I made was I cut back even a little more on the wing sauce, since mamma was afraid it would be too hot for her, and it was still delish. If I was making it for me and my husband I would use the 1/3 cup measurement without any qualms. So don’t be afraid to alter that ingredient to your personal taste. This would also make a great dip! Thanks for creating it! So delicious I made it two weeks in a row – I might have a slight obsession! Just made this for dinner tonight and it may just be my new favorite!! Anything buffalo chicken is a hit in my house, but I was worried about the quinoa because I can’t get my husband to ever eat it, but he had seconds tonight! Thanks for another great recipe! Just tried this tonight — came out FABULOUS! Glad you made the note about the 1/2 cup of wing sauce being HOT — I used 1/3 cup, and I usually like things on the spicier side, and 1/3 cup was perfect for my taste. From one home-grown Buffalo (well…Cheektowaga) girl to another, great job (as always) and thanks for sharing! I made this a couple of weeks ago and it was amazing. I have tried over and over to like quinoa to no avail but this was so creamy and spicy I just had to go buy more quinoa! This is definitely going into the regular rotation. I also like the crunchy celery and carrots it does seem like buffalo chicken without that crunch. Just made this for my lunches this week and my hubby and I love it! It’s the fPerfect combination of creamy and spicy! This is the first recipe I have tried from your site and can’t wait to try more. Thanks! Holy Yum! My friend Bevin introduced me to your site, and I have made many of your delicious recipes. But, this one deserves a comment. This is amazing!! The only thing I did different was cook the carrots a bit. I honestly cannot believe how great this tastes. Loved this! I made mine using a cup of frozen peas & carrots (thawed out in the microwave first) since I’m not a fan of celery and it turned out great! It’s the first time I’ve made a dish with quinoa that my husband liked enough to go back for seconds. This is delicious! I may have to only make it when I have family around or am going to a party-I find myself getting to the fridge for second and thirds!! Love it. Delicious!! Any idea how it might freeze? I’m going to freeze a few pieces of it, so I will report back! Would this recipe freeze well? I’ve never frozen it, but definitely give it a try! Made this for dinner tonight, it was amazing! This was so good – and I am loving the leftovers (no freezing needed for this)! The boyfriend still “doesn’t get” what quinoa is, but he loved it too! This looks so good! How prominently does the yogurt feature? Would I be able to swap it for plain greek yogurt or do you think that might be too tangy? I’ve made this 3x times and it’s a definite favorite!!! I have one casserole in the freezer as we speak for an upcoming vacation. I am a huge fan of anything buffalo, and the combination of healthy ingredients is very tasty to my boyfriend & me. What we don’t eat the first night is quickly polished off the ext day for lunch & dinner, lol! I’ve made this 3x times and it’s a definite favorite!!! I have one casserole in the freezer as we speak for an upcoming vacation. I am a huge fan of anything buffalo, and the combination of healthy ingredients is very tasty to my boyfriend & me. What we don’t eat the first night is quickly polished off the next day for lunch & dinner, lol! This was a such a great recipe!!! I made it tonight for dinner for me and my hubby and it was such a hit!! I didn’t add the blue cheese or the cheddar cheese… It tasted great even without these. I was wondering what the point count was without these? Thanks for sharing this recipe! Buffalo girl here who loves all things buffalo flavored. Made this a few weeks ago and have been raving about it ever since. I’m a single gal who makes one recipe a week so I rarely make something twice. This will be made again for sure!! Had this for lunch today and wasn’t hungry HOURS later. Your recipes are wonderful for a teacher like me with after school responsibilities who tries very hard to stick to her points for the week…..went on a five hour cooking spree yesterday, so I have about a months worth of lunches and dinners….. Love all things Buffalo (downstate NYer here) and you have so many yummy ones to select from….. Thank you!!!!! Making this for the second time tonight, my parents aren’t fans of quinoa but I got them to try this and they love it! Such an easy dish to reheat for lunches as well!! Just made this – delicious! My grocery store only had red quinoa, which I didn’t think would work, so I substituted farro – worked great! First time cooking with farro too – will use again! Yum, I love farro! I’ll have to try it that way! YUM! These look so good and I’m a big buffalo chicken fan so this is a must try. Thanks Emily!!! Made this last night and LOVED it! Was a very big portion, and reheated wonderfully for lunch at work today. Thanks for posting! can you substitute sour cream for the yogurt??? This was the bomb.com!! I was being lazy and used a rotisserie chicken and frozen quinoa from Trader Joes. So easy and beyond yummy! Thanks for the recipe! This is my and my boyfriend’s all-time favorite meal. Can’t tell you how many times we’ve made it. We use plain fat-free Greek yogurt. Makes the texture much thicker, which we prefer. Once we used regular yogurt instead, and it was too soupy for us. 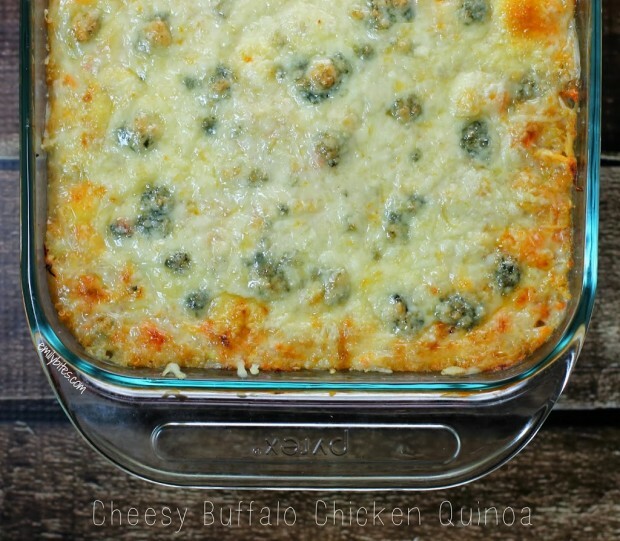 Love this recipe with use of yogurt in the Buffalo Chicken Quinoa Bake ! This looks so delicious and fresh. Thanks for sharing! This was sooo good! I was afraid a bit of the blue cheese dressing because I wasn’t sure I’d like it (I haven’t had it before) but this dish is just the perfect amount of tangy and creamy and spice from the hot wing sauce. I love that this has quinoa, it really works here and complements the flavors and texture well. For the most part, I followed the recipe instructions as directed. While I used blue cheese, I did not crumble extra blue cheese on top, I just sprinkled a bit of mozzarella on top of the sharp cheddar. Also, I hate celery, so I added thawed frozen baby peas instead. The carrots I sauteed a bit before adding to the bake because I don’t like crunchy raw-ish carrots just like some commentators here. My boyfriend loved this so much too. He’s the kind who doesn’t eat quinoa but he inhaled this. This bake is definitely in my dinner rotation now! I made this Sunday night for this week’s lunches. I used plain greek yogurt in place of the plain yogurt and left out the celery (not a fan). I didn’t have any ranch on hand, so I substituted with fat free sour cream and a couple teaspoons of dry ranch dressing mix. I hate bleu cheese, so I left that off as well. Delicious! I liked the crunch of the carrots, but I think I will leave them out next time. They gave it an odd sweet element that I didn’t care for. All in all, a winner! Thanks! Making this (right now!) subbing a bunch of things because I’m picky. Sour cream for the yogurt, cauliflower instead of carrots and celery, and couscous rather than quinoa because I was wrong about what was in that box I had. Anyway, I’ll let you know later how it comes out! I made this today and it is absolutely fantastic. The only thing I did differently was use fat free cheddar instead of the reduced fat..which brought the total to 7 WW points plus per serving. Do you think this would work as a freezer meal? Put the casserole together and freeze before baking? Thanks! I’ve never frozen it, so I can’t say for certain. Report back if you try it! Hi! I’m not a very experienced cook but want to try new thinge and this looks great! How do you normally make your shredded chicken? Thanks! What the approximate serving size for this? Hi Megan, the serving information is located directly under the recipe title in the recipe section of the post. For casseroles I usually just cut it into X number of pieces and serve it that way. If I wanted to make in advance and freeze it do you think I should bake it and the. Freeze or freeze with it all mixed before baked?! Thanks- looks amazing!!! I almost never ever freeze anything so I am the worst person to ask unfortunately. With that said, I would probably freeze it before baking. Let me know how it works out! I will definitely be making this one again! My only dislike was it seemed to be on the dry side. I dont know if I did something wrong. It was the kind of dry that makes you want to dip it in something. Oh and a 1/2 cup of Buffalo wing sauce wasnt hot enough for me! I used a Sweet Baby Ray’s buffalo so I might try something different next time. Thanks for making such easy and delicious recipes! Glad it was a hit! How many servings does this make/what is a serving size? Thanks.